Take a look inside ! 4 letting rooms, king-sized beds, en-suite shower rooms and tea/coffee clock Radio in each room everything you would expect in a modern Bed & Breakfast . £105 for family room per night, bed & breakfast. Sat 12.00 – 9.00 Sun 12.00 – 6.00. The Inn was probably named The Three Horse Shoes because of its close proximity to the old smithy next door. The blacksmith in business on the premises was George Henry Hunt, a farrier and shoesmith, who retired in 1946 after having been in business for 50 years and died in 1950. In 1988 the Inn changed its name from The Three Horse Shoes to “The Lix” until 1993 when it reverted back to its original name. 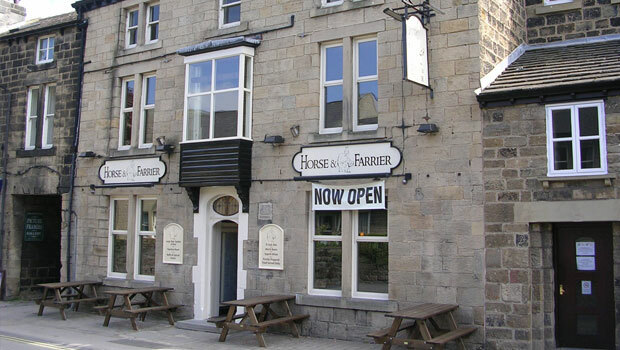 In 2010, Market Town Taverns purchased the property, and following extensive refurbishment, it re-opened on Wednesday, 20th April 2011 under its new name of the “Horse and Farrier.” Food is now served daily and there is a new function room available on the first floor for private parties. On Monday, 15th August 2011, a book was unveiled at the Horse & Farrier which gives details of each of Market Town Taverns’ 15 outlets. The book, “Market Town Taverns – the thinking person’s pub company”, is available at the pub for £7.50 which also includes a free pint of beer or glass of wine.